It was definitely time for these independent girls to learn where they belonged should they ever need help getting back here! 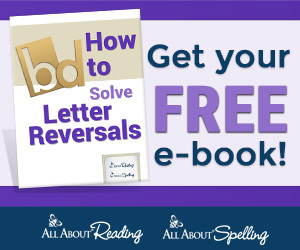 Now I could have just taught them our address, so many times it seems that even with their address memorized, kids don't know the meaning of the words. How easy is it to confuse country and county, and not every street is called street. I wanted something to clarify the terms while teaching the girls where they lived. I decided to use Location Nesting Boxes to illustrate the terms while teaching them their address. 1. To start with you need to decide how many locations you want to teach. We broke ours into planet, continent, country, state, county, city, street, and house. 2. 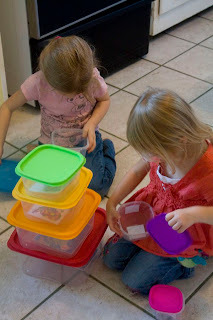 Next, you will need a set of nesting containers like these with rainbow lids or the ones I used . Since they nest they take up much less room when stored! 3. Find some images to use for each box. I used 2 images for each box, one on the outside and one on the inside (more on this later). 4. 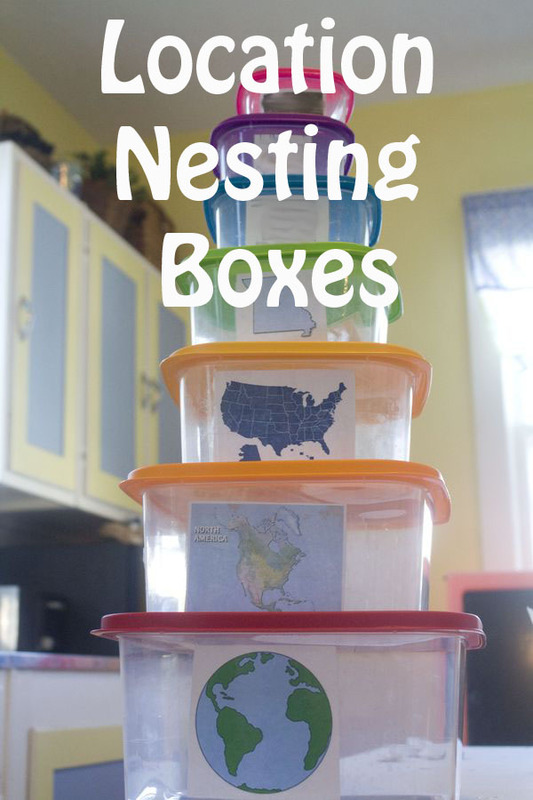 Tape images to the outside of boxes using clear packing tape. Cover them completely for maximum durability! 5. Laminate images for the inside of boxes. 6. 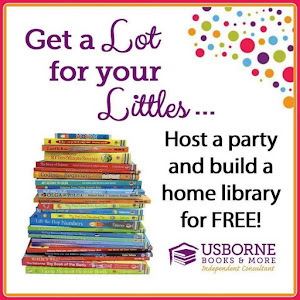 Introduce them to the kids! I chose to introduce the location boxes while they were stacked starting with the largest, and then I allowed the girls to nest them together on their own to see how the smaller locations fit within the larger location rather than being a completely separate and unrelated thing. I mentioned earlier that I had used 2 pictures for each box. On the outside of each container I taped a picture of the whole location, but on the inside I placed a laminated picture that showed the details of that particular location. 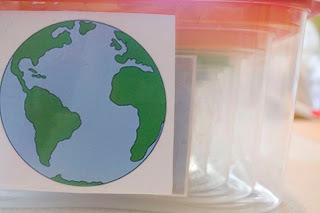 For example, the largest box was the planet we live on, earth, so an image of the earth is on the outside, but on the inside I added a laminated picture that showed the parts of the earth, oceans and continents. Likewise, for the continent box I zoomed in on North America, but on the inside divided North America into countries. So the boxes lead to the smaller boxes rather than appearing like unrelated land masses. So again for the country box I taped an image on the United States, but put a map with all the states labeled on the inside. I continued this until we got to the smallest box which would be our house number. I placed a picture on our house on the outside and inside I placed a laminated piece of paper with our address and phone number. Both the pictures taped to the outside as well as the laminated pictures on the inside have held up well to little hands as well as little feet knocking them over. And the nesting ability allows me to sit them on a shelf in an orderly fashion! As I said above, I introduced the boxes by starting with the planet. I explained that we live on earth, and it is made of land called continents. Then I showed them the continent box and repeated with North America. I showed them all the boxes being sure to use the terms I wanted them to learn. This we repeated often until I could ask them what the pictures were and they could tell me. We also practiced nesting them inside each other. I showed them how houses were on streets, and streets made up cities all the way down to continents making up the land of earth. This was easier for them to practice together since once they knew the words they could simple use single words to describe each box. Another thing they enjoyed was stacking the boxes. 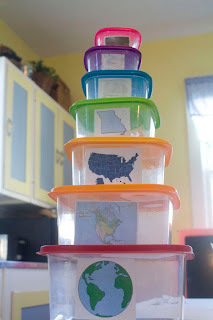 If they stacked them correctly they would have all the locations in order from largest to smallest giving a great visual that they could go through and label. Being the creative kids they are, they made up their own game as well. It involved removing all the inside pictures and then trying to match them back up with the boxes. After much repetition, they learned their address as well as their state, country, continent, and planet. Ok, they may have already know the planet. They still have some trouble with the county, but I am sure they will get it in time. I do think the visual of each smaller piece being part of the larger piece helped their understanding which made it easier for them to remember what was what. I think that is a big part of the battle when teaching kids. You can say, you live in the state of Missouri, but none of those words have any meaning. But when you can show the state and how the states form a country, and a continent, and the world, that means something. And them knowing their address means a little extra piece of mind for me just in case of "what if!" Now that the kids know where they live, you can expand and teach them the other continents with our Continent Hop!